Insert the flash drive into one of your computer’s USB ports. Laptops, like cameras, often have a slot for a memory card. Want to turn your memory card into a flash drive? Simply buy a device called a dedicated or single-purpose memory card reader. Strictly speaking, a multipurpose card reader also works, but multicard readers cost more and are often larger than single-card readers. In addition, a dedicated memory card reader doesn’t need a cable to connect a camera to a computer. You can just download your pictures to your hard drive from the card. If Windows 10 displays a notification when you insert the flash drive or memory card, select Open Folder to View Files, which will open File Explorer on the desktop. If File Explorer doesn’t open automatically, go to the desktop and then select the yellow folder icon in the taskbar to open File Explorer. In File Explorer, navigate on the left to the folder that contains the files you want to copy. Select the folder. On the right side of File Explorer, select the folder or file you want to copy. If you see a check box to the left of each object you want to copy, you can select each check box to copy multiple files simultaneously. To select every object on the right simultaneously, use the Select All button on the Home tab. You can also select the files you don’t want to copy and then use the Invert Selection button on the Home tab; deselected files become selected and vice versa. You can select files in other ways as well. The keyboard shortcut to select all files in File Explorer is Ctrl + A. In the Ribbon, select the Home tab and then select the Copy To button. Select Choose Location from the menu that appears. You can move files if you want them gone from their original location. To do so, select the Move To button. Follow the remaining steps, but substitute the word Move for Copy. In the Copy Items window, under the This PC heading, locate the flash drive or memory card. 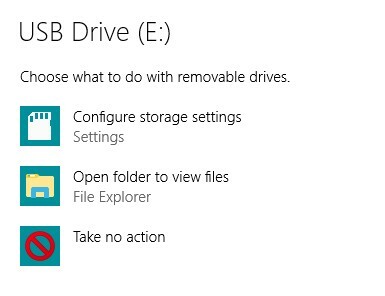 The drive will not be Local Disk (C:), where Windows 10 resides. Select the removable flash drive or memory card to which you want to copy the files and then select the Copy button. If the files copy quickly, you may not see any indication of progress; otherwise, a progress bar is displayed until copying is complete. If you select your user name in the Copy Items dialog box, you may see OneDrive listed in the expanded list. Files you copy to OneDrive are automatically copied to the cloud and to linked computers. Replace the File in the Destination: Selecting this option replaces one file with another. Be certain that you don’t need the replaced file (as you might if you want to keep different versions of files). 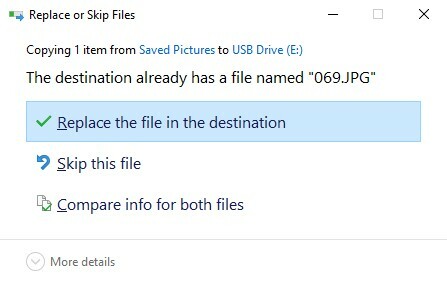 Skip This File: Selecting this option does nothing with this file. Compare Info for Both Files: Selecting this option opens another window in which you can select files on the left to replace those on the right, and select files on the right to keep. Selecting the same file on the left and right creates a second file with a number added to the name, such as my file (2). This option enables you to have the original and the new file. Select one of the previous options. If you selected Compare Info for Both Files, select the files to replace or skip, and then select the Continue button. You may or may not see a progress indicator, depending on how quickly the files are copied. Confirm that the copy worked by navigating on the left to the location you selected as the destination in Step 6. If the files are there, congratulations; you’re done. If not, try Steps 4 through 6 again. Remove the flash drive or memory card you inserted in Step 1. You’re good to go. If you have files or folders that you’d be devastated to lose, follow the steps in this task to create backup copies of those items on a portable storage device. Then keep that device in a safe place. To copy files from a flash drive or memory card, follow these same steps but select the flash drive in Step 3 and the folder or other destination to which you want to copy or move files in Step 6.